If you go back and look at the most revered Disney movies of the past 25 years, you’ll find that most of them are not very clever with their comedy. “The Little Mermaid,” for one, has very few laugh-out-loud moments, though it has some of the best songs in Disney’s catalog. “Frozen” splits it down the middle, boasting a couple of killer songs (“Do You Want to Build a Snowman?,” sung by little Elsa and Anna, is heartbreaking) and more goofy personality than anything Disney’s ever done. When Anna sings about being in love for the first time, she makes a comment about how she’s not sure if she’s just gassy instead. There’s a looseness to the material that is intoxicating, and nothing captures this better than the bits where Kristoff “talks” to his reindeer Sven. To say more would spoil the fun. 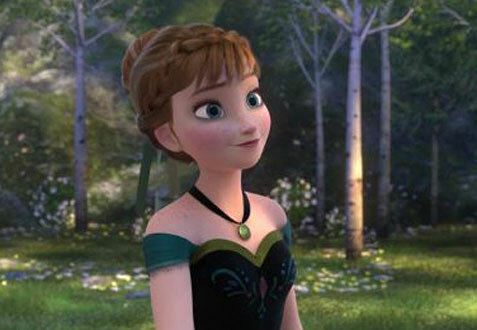 It also helps that Anna might be the most adorable Disney princess ever. The deft voice work by Bell is a plus – and she proves to be a top-notch singer as well – but it’s her personality (there’s that word again) that makes Anna so engaging. She’s devoted to her sister despite the emotional distance, and she’s fearless in the face of real danger. She might have her weaknesses, but she’s no damsel in distress, thank goodness. Menzel, meanwhile, is on familiar ground; Elsa possesses supernatural gifts but is misunderstood, much like Elphaba, the character Menzel played in the musical “Wicked.” She knows exactly what the role calls for and delivers. The male leads do what is required of them; since both know that they will be upstaged by a Jerry Lewis-riffing snowman named Olaf (Josh Gad), they wisely stay within their zones. 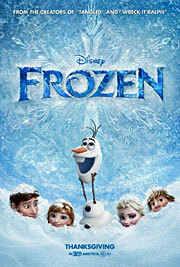 In fact, the movie’s most memorable line is a brilliantly simple off-camera gag involving Olaf. You’ll know it when you hear it. One last thing: the movie is gorgeous. Disney has stepped up their game on the animation front lately, but nothing they’ve done in the world of CGI comes close to what they do here. Hopefully, though, the beautiful animation is the last thing that people remember about “Frozen.” Yes, the story has some trouble transitioning to the climax, but the themes that the movie explores regarding the importance of guiding your children through some of life’s more complex issues, as opposed to being overprotective of your kids and, as a result, emotionally starving them, are quite timely in the age of social media. Suddenly, the race for Best Animated Feature just got a lot more interesting.